In Windows, a file moves to the Recycle Bin when you delete it. The Recycle Bin’s icon changes to represent crumpled trash paper inserted into a bin. When you empty the Recycle Bin, it turns to look like an actual bin which has been emptied. That is how you know that your files have been removed from the computer entirely. The question is – what happens to a file when you delete it? Is there a way that you can recover a file after deleting it? From a computing point of view, when you delete a file, the computer system removes a reference to that file. The computer assumes a file is deleted when that file’s header is removed, and as a result, the computer cannot see the file, hence, considers that file as having ceased to exist. Therefore, the space that was occupied by the deleted file is marked as empty and any other file that would wish to occupy that space will be allowed to do so. In the real sense, however, a file deleted by sending to the Recycle Bin in Windows, is not removed from the hard disk. It is just that the computer will not access, read or open it, so that another file will have the opportunity to use the deleted file’s allocated space. This is the logic that file recovery software applies when restoring deleted files (or in Windows terms, files emptied from the Recycle Bin). The recovery software rewrites the deleted file’s header and allows the computer system to see the file again. However, this principle will only apply if your computer has not saved any file on the deleted file’s previously allocated space. If you feel some of your files have been deleted accidentally, and you want to try and recover them first thing you don’t do is save any files into it. Because the computer marks the space of a deleted file as usable by any other file, you should use the computer as little as possible to reduce the chances of another file being allocated the space occupied by a deleted file. The more you use the computer, the more you reduce the chances of file recovery techniques restoring the deleted file. A regular file backup routine is encouraged to reduce the chances of completely losing your data in the case of file deletion or corruption. If you use backup software or procedures, simply copy back a deleted file from the backup media (for example, external hard disk or cloud storage). The common operating systems send a deleted file to an area that holds all deleted files. In Windows, it is sent to the Recycle Bin, while in Apple MacOS and Linux systems it is sent to Trash. Therefore, if you wish to recover a deleted file, first check the Recycle Bin. If the Recycle Bin has not been emptied, simply restore it to its previous state. Locate the file(s) you wish to restore then select them. Right-click to open the context menu then choose the Restore option to send the files to the location they occupied before the deletion occurred. Locate the files you wish to restore then select them. Right-click to open the context menu then choose the Cut option. Go to the location you wish to restore files to then click Paste. Locate the files you wish to restore then select them. Drag-and-Drop the deleted files to the location you wish to restore them to. Recuva: See how to use Recuva to recover files. Restoration. See this list of 5 free file recovery programs. File recovery software requires administrative privileges to run effectively. Therefore, if you use Windows Vista or Windows 7, right-click the software’s shortcut or icon then choose the Run as Administrator option before executing the file recovery software. Once you run the file recovery software, you will need to select the driver letter on which the deleted file was stored. Once you specify the drive letter (let’s say drive C for example), the software will search this drive C and produce a list of all deleted files that are still recoverable. What you will need to do is pick the file name from the list you want to restore and then hit the restore button. The file will be restored in a designated folder specified by you. In cases where freely available data recovery software fails to restore your deleted files, you should consider using the services of companies that specialize in data recovery. You should note however that these companies charge high fees and are mostly suitable for recovery of very important or sensitive data. 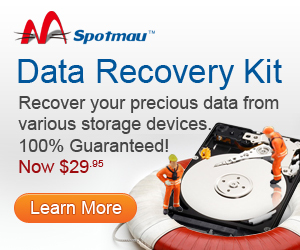 You can try The World Leader in Data Recovery Software! No Recovery, No Charge!